Use this page to find out about our vision and purpose, our work in New Zealand fighting road crashes and supporting victims, and how to support us. Brake's vision is a world that has zero road deaths and injuries, and people can get around in ways that are safe, sustainable, healthy and fair. We are a humanitarian charity, working with urgency and in partnership with others to implement evidence-led solutions to a crisis that affects us all and our planet. Read more about our vision, mission, values and aims. New Zealand has a driving culture and poor record of road casualties compared with some other developed nations. For many Kiwis, there are limited sustainable or active transport choices. 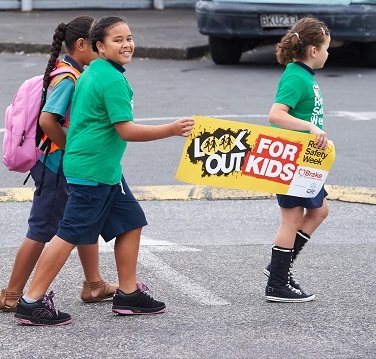 Brake provides information and advice, through resources, events, training and the media, to help Kiwis be more safe, sustainable and active road users and to enable us all to campaign for change. We also provide help for New Zealanders who are bereaved and seriously injured on roads. An important part of our work is inspiring and engaging more people. We prioritise working with those who can make the most difference, including communities, parents, schools and kindys, employers operating fleets, victim support professionals, and government officials. -make sure our voice is heard in the media. Brake is funded entirely by donations from, and fundraising by, individuals, groups, schools and companies, and through grants. Find out about our supporters, and how to support us, below. We need your support urgently to grow in New Zealand. Companies and organisations that put road safety at the top of their CSR activities, and how you can too. How people have fun helping us - and how to take part. Join Brake and keep up to date on road safety issues. Join for free to get our monthly Brake news bulletin or our regular bulletin for fleet and road safety professionals. Follow Brake on our social media channels and share our stories. We're on Facebook, Twitter, YouTube and LinkedIn. The quickest and simplest way to help us. Go to our contact page for information on getting in touch with Brake.